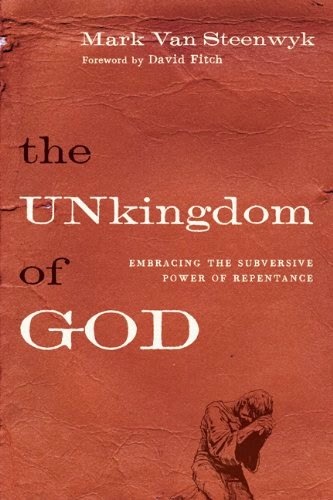 Mark Van Steenwyk’s The unKingdom of God is one of those books that makes me feel like I’m reading my own story. Of course Mark’s background is pretty different from my own, but the struggles he’s had with mainstream Christianity and the changes he’s gone through in his theology completely resonate with my own experience. An interesting challenge quickly emerged. … I assumed that the Bible was full of metaphors and poetry and prose and illustration. I didn’t read it literally. Except for the parts where it was, you know, obvious. I treated the life and sermons of Jesus in a much more straightforward manner than, say, the book of Revelation or Jesus’ parables. During Sunday school, the youth leader asked for prayer requests. And so, head filled with recently acquired New Testament insights of a radical Jesus, I offered to pray that God would forgive our church’s war vets for killing their enemies. That didn’t go over very well. The youth leader got mad. Finger-pointing-in-face mad. I was genuinely confused by his anger. I wasn’t trying to cause any trouble. But I quickly learned that my way of reading the Gospels was inadequate and that my respect for my elders was insufficient. The moment I actually did start reading the Bible for myself and applying the really obvious parts, I became a compromising liberal who was dangerously close to being a heretical cultist. Love your enemies? Sure, but only if they aren’t also God’s enemies. In that case, look to the Old Testament conquest narratives to learn how to deal with them. But doesn’t God love the whole world? No, Jesus couldn’t have possibly meant what he clearly said. God only loves his elect. He hates sinners. Just forget what Jesus taught and keep going back to the Old Testament. And sadly, such a horrible reading of the Bible is not limited to the fundamentalist circles I came out of. This way of thinking has contaminated many of the largest segments of the church for most of its history. Instead of advancing the kingdom of God through self-sacrificial love of enemies, we’ve advanced the agendas of empires, persecuting those who disagree with us. Christianity has so much to repent from. We need to own up to the horrible things that have been done in the name of Christ. We need to personally repent from them. And then we need to actually change as a result. If none of this strikes a chord with you, then I don’t know if I’d recommend that you read this book. But if you do see a contradiction between the teachings of Jesus and the examples of his followers—and if you want to be a part of changing that—then I would definitely recommend taking a look at The unKingdom of God. That said, I don’t mean to sound as if this book is the be-all end-all “thing we’ve been missing” to save the church. What Mark has given us is a starting point. He’s initiated a conversation that needs to be had. And he has modeled the repentance that we need before any true change can occur. Disclosure: I received a free copy of this book from SpeakEasy in exchange for an honest review.